Maj. Nidal Hasan, charged with killing 13 people in a November 2009 shooting spree at Fort Hood, Texas, in an undated Bell County Sheriff's Office photo. 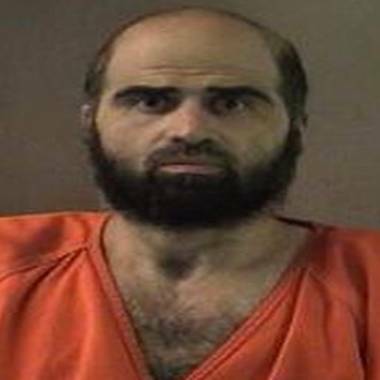 A military judge barred Army Maj. Nidal Hasan on Friday from arguing at his court-martial that he was legally acting to protect Taliban leaders when he killed 13 people and injured 32 others in a shooting spree at Fort Hood, Texas, in 2009. Hasan, who's representing himself, has said the shootings were a premeditated "defense of others" to safeguard Mullah Mohammed Omar and other Taliban leaders in Afghanistan from attacks by the U.S. military. Hasan, 42, a Muslim-American Army psychiatrist, faces the death penalty if he is convicted in the Nov. 5, 2009, shootings. The judge, Col. Tara Osborn, said Friday that Hasan's argument "fails as a matter of law" and barred him from alluding to it in any way because the legitimacy of U.S. involvement in Afghanistan is "a non-justiciable political question not before the court," the Killeen Daily Record reported. "None of (the victims) in Fort Hood, Texas, posed an immediate imminent threat to those in Afghanistan," she said. Hasan is seeking a three-month delay in his court-martial, which would be held at the same base he shot up 3½ years ago. Although he fired his three defense attorneys, Osborn has ordered them to assist him anyway — an order they've objected to. Rulings on those two matters were still pending Friday afternoon. Hasan's next hearing is scheduled for Tuesday.